This paper defines the knowledge society as a human structured organisation based on contemporary developed knowledge and representing new quality of life support systems. It implies the need for a full understanding of distribution of knowledge, access to information and the capability to transfer information into a knowledge. The understanding of knowledge is the central challenge when defining a knowledge society. From our present perception of knowledge society, it is of interest to emphasize the role of the knowledge society in future development of human society. The life support systems are essential pillars of human society development. In this respect knowledge society represents a new paradigm for future development and it is strongly correlated to sustainable development. For this reason the sustainability paradigm of knowledge society is a potential frame for human society development leading to social cohesion, economic competitiveness and stability, use of resources and economic development, safeguarding biodiversity and the ecosystem. In order to verify the mutual relation between knowledge society and sustainability, we have to introduce the difference between these two terms. The knowledge society is based on the agglomeration of eco-knowledge, env-knowledge and soc-knowledge, it may be evaluated as the complex knowledge of quality of life support systems. We have to introduce metrics which will allow us to present knowledge as the paradigm of the number of indicators for verifying progress made. Sustainability metrics are designed to consolidate measures of economic, environmental and social performance of any system. It can be understood as a pattern for evaluation of the available knowledge about systems and their performance. In particular the decision-making process for the selection of the system under consideration must be based on the available knowledge. The link between knowledge and sustainability makes it possible for us to visualise that the sustainability paradigm is the essential frame for the knowledge society. In the Wikipedia encyclopaedia knowledge is defined as “physiological result of perception and learning and reasoning”.1 In contrast to information, knowledge requires organisational structure of facts with respective attributes reflecting specific properties and processing. The agglomeration of knowledge is immanent to science and technology development. It represents quality and quantity description and understanding of our perception of material, social and cultural life. The link between different quality of life support systems is essential. Throughout human history the knowledge structure has been formed leading to the formation of its division into the specific branches devoted to individual entities. With the development of information technology in hardware and software form, a new opportunity was opened for the further systematization and organisation of available knowledge. The knowledge base becomes a powerful tool for knowledge organisation and for making its potential for economic, cultural, and technological development available. The essential source of knowledge is science. Science from its early days has been focused on the gathering of available knowledge in nature and, through systematic reasoning, on promoting a formation in different areas of science of human interest. Agglomeration of scientific knowledge has introduced the need for its organisation, which in turn has led to the formation of different disciplines and their interdisciplinary and multidisciplinary correlation. It can be seen that since the beginning of the industrial revolution in 1850 the increase in energy consumption has been the result of the invention of the Watt machine. The second phase found at the beginning of the First World War involves machines resulting from the need for new technologies for war. A similar period occurred at the beginning of the Second World War, which introduced a breakthrough in many scientific disciplines leading to a new quality of life. It should be mentioned here how fission and other nuclear process changed the outcome of the Second World War. The industrial revolution opened a new era in the promotion of the need for new scientific and technological inventions in order to promote economic, social and cultural development. This period is characterised by an enormous quantity and quality of knowledge which introduced the need for the organisation of the knowledge society to accommodate the further development of human society. A sustainable knowledge society has to meet a number of diverse criteria. Among these are: sustainability discourse, economic models, characteristics of the emerging knowledge society. In order to have metrics for these criteria the different indicators are designed capable of identifying the goals of the research agenda. To clarify our understanding of the sustainability of knowledge society it is of interest to define sustainability as the dynamic state of a complex system characterised by the criteria comprising the social, institutional, and environmental contribution to global long term human welfare based on their specific and unique set of inherent goals and functions. 4 The system approach emphasises the interacting characteristics of different facets of human development and how the failure or omission of one function can negatively affect the whole system. Moreover, the system approach comprises a potential possibility of defining the quality of the system. Within this context, the concept of “information society” as a political and ideological construct has developed under the direction of neo-liberal globalization, whose main goal has been to accelerate the establishment of an open and “self-regulated” world market. This policy has counted on the close collaboration of multilateral organizations such as the World Trade Organization (WTO), the International Monetary Fund (IMF), and the World Bank, in order for the weak countries to abandon national regulations or protectionist measures that “would discourage” the inversion; all with the known result of a scandalous widening of the gaps between the rich and the poor in the World. The knowledge society is a human structured organisation based on contemporary developed knowledge and representing new quality of life support systems. It implies the need to fully understand distribution of knowledge, access to information and capability to transfer information into knowledge. The understanding of knowledge is the central challenge when defining a knowledge society. From our present perception of the knowledge society, it is useful to emphasize the role of the knowledge society in the future development of human society. The life support systems are essential pillars of human society development. In this respect the knowledge society represents a new paradigm for future development and it is strongly correlated to sustainable development. For this reason the sustainability paradigm of the knowledge society is a potential frame for human society development leading to social cohesion, economic competitiveness and stability, use of resources and economic development, safeguarding biodiversity and the ecosystem. The knowledge society is based on the need for knowledge distribution, access to information and capability to transfer information into knowledge. Knowledge distribution is one of the essential requirements of the knowledge society. It has to be based on equity and non-discrimination, justice and solidarity. It implies understanding of knowledge as the central pillar of the knowledge society. Knowledge is more then information. It requires information processing with the specific aim of obtaining the conceptual understanding of life support systems within a specific cultural system. The global validation of information is immanent to the knowledge society. So, access to the global information pool is the main driving force for the development of knowledge society. The capacity for information transformation into knowledge is represented by the ability of the cultural system to convert available information into scientific and technological values used in everyday life. It strongly depends on the cultural and social system. The notion “knowledge society” emerged toward the end of the 90s and is particularly used, by some in academic circles, as an alternative to the “information society”. A nuance in this debate, which only concerns the Roman languages, is the distinction between “sociedad del conocimiento” and “sociedad del saber” (which both translate as “knowledge society” in English). The notion “saberes” implies more precise or practical certainties, while “conocimiento” encompasses a more global or analytical comprehensiveness. André Gorz considers that “conocimientos” refer to “formalized targeted contents, which cannot, by definition, belong to people...“Saber” consists of experiences and practices that have become intuitive evidence and customs.”7 For Gorz, “intelligence” covers the whole range of capacities that allow combining “saberes” with “conocimientos”. He then suggests that “knowledge society” be translated as the “intelligence society”. In any case, in general, within this context the terms “sociedad del conocimiento” and “sociedad del saber” are used interchangeably, although, at least in Spanish, “conocimiento” seems to be more common than “saber”. The role of knowledge society in contemporary life depends on the level of the new development of the science and technology. With cognitive science the modern society will reach its essential level, giving opportunity to the public at large to take advantage of the knowledge society development. “The past 50 years have seen extraordinary progress for Europe. However challenges of globalisation and the competitive challenge from the United States and from the emerging economies such as China and India have placed new threats to Europe. Five years ago the European Union launched an ambitious agenda for reform leading Europe to become the most dynamic and competitive knowledge based economy in the world capable of sustainable economic growth with more and better jobs and great social cohesion, and respect for the environment. Over the last year the Commission has been reviewing the progress made in the Lisbon Process. There is a general consensus that Europe is far from achieving the potential for change that the Lisbon strategy offers. The European Union has almost 20 million unemployed people, an ageing population and youth social exclusion. Europe’s performance has diverged from that of our competitors in other parts of the world. Their productivity has grown faster and they have invested more in research and development. The world knowledge society reflects the human capital generated in the form which is quantified as economic knowledge, environmental knowledge and social knowledge. In this respect human capital comprises wholeness of the life support systems. Economic knowledge is at the heart of economic growth and the gradual rise in levels of social well-being. The ability to invent and innovate, which is to create new knowledge and new ideas that are then embodied in production, processes and organisation has always served as the bases for future development. The knowledge-based economy is a recently coined term. As such, its use is meant to signify a change of economy from an earlier period to the present day. Environmental knowledge represents the agglomerated knowledge of human environment development. It comprises the collection of historical data decrying world climate changes through the history of our planet. Besides following the changes of planetary history environment knowledge is one of the essential knowledge pillars for understanding the creation and development of life on our planet. In this respect the world agglomerated environmental knowledge is the basis for learning about our past and future. Social knowledge is a term describing human history. It follows the knowledge of different levels of the social well being structure and its transformation through history. Sustainability is a notion which comprises the multi-criteria validation of the system.Sustainability is a metric of the quality of human life. It includes economic, environmental and social validation. It is understood that no generation will indebt any future generation’s comfort. Sustainable development encompasses economic, social, and ecological perspectives of conservation and change. In correspondence with the WCED, it is generally defined as “development that meets the needs of the present without compromising the ability of future generations to meet their own needs.” This definition is based on the ethical imperative of equity within and between generations. Moreover, apart from meeting the basic needs of all, sustainable development implies sustaining the natural life-support systems on Earth, and extending to all the opportunities to satisfy their aspirations for a better life. Hence, sustainable development is more precisely defined as ‘a process of change in which the exploitation of resources, the direction of investments, the orientation of technological development and institutional change are all in harmony and enhance both current and future potential to meet human needs and aspirations. This definition involves an important transformation and extension of the basic concept of physical sustainability to the social and economic context of development. Thus, terms of sustainability cannot exclusively be defined from an environmental point of view or based on attitudes. Rather, the challenge is to define operational and consistent terms of sustainability from an integrated social, ecological, and economic system perspective. This gives rise to two fundamental issues that need to be clearly distinguished before integrating normative and positive issues in an overall framework. Sustainability provides a framework for integrating economic, environmental and social interests into effective strategy. For life support systems that recognise the need to embrace sustainable development the first step is to understand how to implement it. Putting this concept into operation requires identifying practical indicators of sustainability and understanding how it can be measured over time to determine if progress is made. Sustainability metrics are designed to consolidate measures of economic, environmental and social performance of any system. It can be understood as a pattern for evaluation of the available knowledge about a system and its performance. In particular the decision-making process for selection of the system under consideration must be based on available knowledge. The link between knowledge and sustainability makes it possible to visualise that the sustainability paradigm is the essential frame of the knowledge society. Since every life support system requires knowledge about its structure, efficiency, operation and maintenance, it is immanent to the knowledge base of the respective system to be organised as the object oriented system. Also, the sustainability of the same system is described by the appropriately selected criteria and corresponding indicators organised in the appropriate paradigm describing its functionality. The mutual relation between knowledge and sustainability reveals the possibility of anticipating the knowledge society as a sustainability paradigm. 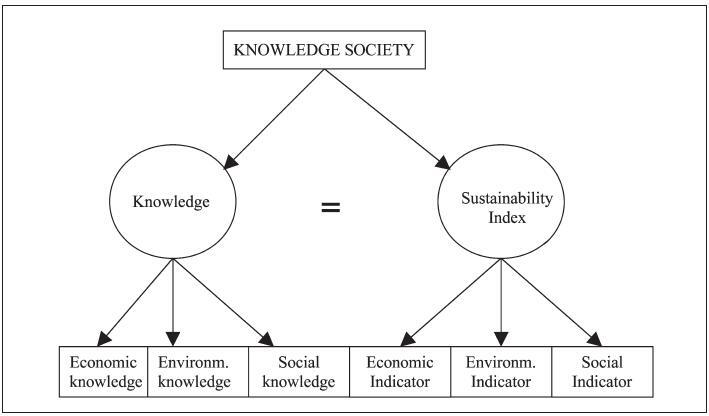 As shown on Figure 3 the knowledge society is organised as the equity between the knowledge and sustainability index. These are structured with economic knowledge, environmental knowledge and social knowledge of the system. The Sustainability Index is composed of economic indicators, environmental indicators and social indicators as the basic indicators of sustainability, including material intensity, energy intensity, water consumption, toxic emission and pollutant emission. Complementary metrics within each of these categories can be developed as support for the need for the knowledge about area decision. Sustainability measurement is characterised by the evaluation of the different qualities of the system. In this respect the quality parameters are defined by appropriate indicators made up of different scales for measurement. It can be numerical value of the specific physical parameter, monetary value, non-dimensional qualitative characteristic or specific sign. All these parameters are given in their own scale, so it is necessary to form a membership function for every parameter to be taken into consideration for the assessment of Sustainability Index. or the increasing function q1(x1). The functions q1(x1), ..., qm(xm) formation process being finished with a matrix q1(j), i=1, ..., m, j=1, ..., k, where an element q1(j) is a value of i-th particular criterion for j-th option. In this analysis it assumed that the linear functions are used. For q1, q2 and q4 membership function q1(x1), ..., qm(xm) the decreasing function are adapted. In order to define weight-coefficient vector the randomization of uncertainty is introduced. Randomization produces stochastic with realizations from corresponding sets of functions and a random weight-vector. It is assumed that the measurement of the weight coefficients is accurate to within a step h = 1/n, with n as a positive integer. In this case the infinite set of all possible vectors may be approximated by the finite set W(m,n) of all possible weight vectors with discrete components. For non-numeric, inexact and incomplete information I = OI U II is used for the reduction of the set W (m,n) of all possible vectors w to obtain the discrete components set W (I;n,m) is defined a number of constraints reflecting non-numeric information about the mutual relation among the criteria under consideration. Economic development basically depends on knowledge availability. Globalisation and new information and communication capabilities provide opportunities as well as challenges for the sustainable consumption and production pattern. In this respect ICT is the modern driving force for economic development. New science breakthroughs and a technology driven pattern of innovation are the basic platform for economic development. It should be taken into a consideration that the achievements in science and technological innovations will not automatically bring about social, environmental and economic improvements. Besides these important elements for economic development new models such as equity, justice and non-discrimination are needed. • To inspire and enable individuals to develop their capability to the highest potential level throughout life, so they can grow intellectually, be well equipped for work, can contribute effectively to society and enjoy active personal fulfilment. • To increase knowledge and understanding for their application at local, regional, national level. • To play a major role in shaping a democratic, civilised and intellectual society. • To promote the exchange of ideas for the development of the knowledge society and merge joint activities devoted to the future development of life support systems. • To learn, evaluate, assess and validate economic, environmental, social and technological advancement to produce benefits based on the knowledge society. It is of paramount importance for world, regional and state economic development to have broad access to the modern knowledge bases. In this respect it is immanent to the utilization of knowledge bases to have appropriate knowledge distribution systems. The education system is the basic means in the dissemination of knowledge. Close links between knowledge bases and education system promote knowledge transfer to all levels of human organisation. The essential component in invention and innovation is knowledge. The transfer and dissemination of knowledge increase ability to invent and innovate, that is to create new knowledge and new ideas that are then embedded in production, processes and organisation. Organisations and institutions capable of the creation and dissemination of knowledge are always part of the education system. The knowledge economy and society stem from the combination of four interdependent elements: the production of knowledge, mainly through scientific research; its transmission through education and training; its dissemination through information and communication technologies; its use in technological innovation. At the same time, new configurations of production, transmission and application of knowledge are emerging, and their effect is to involve a greater number of players, typically in an increasingly internationalised network-driven context. Education for sustainable development is a) teaching basic reading, writing and arithmetic skills to all, b) convincing people why they should not pollute, c) developing knowledge, skills and programmes that will end poverty for good, d) learning how to make decisions for the good of the whole community. The emerging knowledge society has increased the priority of education and learning in society. The Lisbon summit in 2000 set the objectives of creating the most cooperative knowledge based economy in the world by 2010. In order to promote, support and organise activities leading to the development of the knowledge society, the organisation of platforms for a dissemination, transfer and utilisation approach, for society as a whole, of education and teaching of essential knowledge in support of a new social structure based on the new quality of life is of paramount importance. Universities are situated at the crossroads of research, education and innovation. In many respects they hold the key to the knowledge economy and society. They play an important role in the creation of the knowledge society. Besides their classical role as educational institutions, they are now a pool of knowledge and research institutions for knowledge generation. Close links between society and universities has generated interaction that proves to be an essential force in development. In addition, universities train an ever increasing number of students with increasingly higher qualifications, and thus contribute to strengthening the competitiveness of the European economy: one third of Europeans today work in highly knowledge intensive sectors (over 40% in countries like Denmark and Sweden). Universities also contribute to the other objectives of the Lisbon strategy, particularly employment and social cohesion, and to the improvement of the general level of education in Europe. Many more young Europeans have a higher education qualification today than in previous generations. While some 20% of Europeans aged between 35 and 39 hold such qualifications, this figure is a mere 12.5% for the 55-59 age group. If we look at the total population aged 25-64, the rate of employment of persons holding higher education qualifications stood at 84% in 2001, i.e. almost 15 points above the average when taking all education levels together, and nearly 30 points more than people who have completed only lower secondary level. Finally, the rate of unemployment amongst those holding higher education qualifications stood at 3.9% in 2001, one third of that of persons with a low level of qualification. However, at present 80 million citizens of the Union are low skilled. This is over 30% of the workforce. However, by 2010 only 15% of all jobs will be available to people with only basic schooling. Better skills will help people find better jobs. More importantly, however, a better-skilled worker will be a more active member of the community. While Europe is certainly a highly educated society, only 21% of the EU working-age population has achieved tertiary education, significantly lower than in the US (38%), Canada (43%) Japan (36%) and South Korea (26%). This will continue to be the case in the years ahead, spurred on simultaneously by the fact that certain countries have the objective of increasing the number of students in higher education and by new needs stemming from lifelong learning. The increasing demand has to be met, finding solutions to the limits in human resources and financial capacity. It is crucially important to maintain and strengthen the excellence of teaching and research, without compromising the level of quality offered, while ensuring broad, fair and democratic access. Doubtlessly the knowledge society will focus its attention on the development of the sustainability concept as the future strategy for its development. As mentioned in a number of sustainability definitions, the concept of the future development of our world has to be based on philosophical issues involving ethical, religious, political and economic principles. The definition of the sustainability concept involves an important transformation and extension of the ecologically-based concept of physical sustainability to the social and economic context of development. Thus, terms of sustainability cannot exclusively be defined from an environmental point of view or attitude. Rather, the challenge is to define operational and consistent terms of sustainability from an integrated social, ecological, and economic system perspective. The weak and strong sustainability concept are discussed in this light. All five definitions stand for the emphasis on specific aspects of sustainability. Definitions a) and e) imply that each generation must bequeath enough natural capital to permit future generations to satisfy their needs. Even if there is some ambiguity in this definition, it means that we should leave our descendants the ability to survive and meet their own needs. Also, in what form resources are to be left and how much is needed for the future generation is not specified, because it is difficult to anticipate future scenarios. Definitions b) and c) are more political and imply that actions should be taken at global, regional and local levels in order to stimulate the United Nations, Government and Local Authorities to plan development programs in accordance with scientific and technological knowledge. In particular in definition c) the ethical aspect of future actions to be taken to meet sustainable development is to be noted. Definition d) is based on religious beliefs playing, as it does, on the responsibility and duties toward nature and the Earth. In this respect it is of interest to mention that the Old Testament, in which the story of creation is told, is a fundamental basis for Hebrew and Christian doctrine on the environment. In the world of Islam, nature is the basis for human consciousness. According to the Koran, while humankind is God’s vice-regent on Earth, God is the Creator and Owner of nature. But human beings are his trusted administrators, and ought to follow God’s instructions, that is, acquiesce to the authority of the Prophet and the Koran regarding nature and natural resources. If it is assumed that our future society will be based on the sustainability concept, it is immanent to it that it has to comply with strong ethical values. The contemporary world is characterised by a number of attributes, including: increase of population, increase of wealth, increase in consumption, increase of poverty, increase of knowledge, development of information and communication technology, development of education systems, new health protection systems, higher treatment of hazard and safety. All these elements are comprised in knowledge bases which represent an agglomeration of the total knowledge of the world. By definition the knowledge society has introduced a new human system pattern. This comprises the agglomerated knowledge accumulated through our planet’s history. With the strong development of information and communication technology it has been possible to create a knowledge dissemination system which promotes the extended use of new inventions and innovations in the production of new products, organisations and quality of life support systems. Sustainability as the new definition suggests, is about the need on the part of human society to comply with the limits to our planet’s resources. It is aimed at imposing the need for every generation to balance the use of economic, social, environmental and technological means with a set of ethical values. One of the essential pillars of the knowledge society is education. It is recognised that this platform for the development of the knowledge society is the essential support for building a new social structure based on a new quality of life. The development of European knowledge society so far is proof that Europe still needs a vision for a society that can integrate both the ageing and the young for the development of both long-term growth and social cohesion. Abdul, W.K. (2005): UNESCO Assistant Director-General for Communication and Information UNESCOs Basic Text on the Information Society, UNESCO Publishing. Afgan N.H and Carvalho M.G. 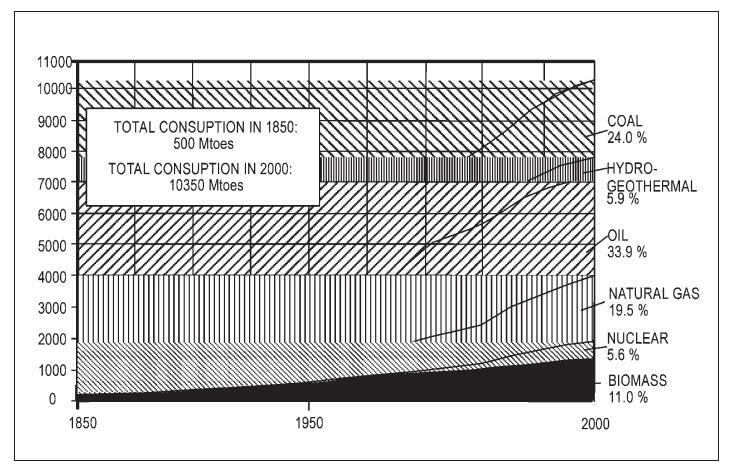 (2000): Sustainability Assessment Method for Energy Systems, Kluwer Academic Publisher, New York. Afgan N.H and Carvalho M.G. (2009): Quality, Sustainability and Indicators of Energy Systems, Begell House Publisher. Agenda 21, Chapter 35, Science for Sustainable Development, United Nations Conference on Environment and Development, 1992. Chapter of Civil Right for a Sustainable Knowledge Society, Document of the Heinrich-Böll- Foundation, May 2003. Jenkinson, C.S., The Quality of Thomas Jefferson’s Soul, White House Library. Knowledge Society - Wikipedia, free encyclopaedia. David P.A. 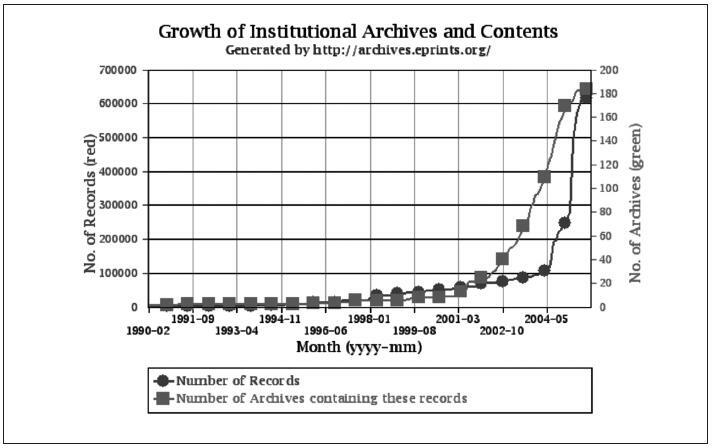 and Foray, D. (2002): Economic Fundamentals of Knowledge Society, The International Social Science Journal, No, 171. Vision in Progress, World Summit on the Information Society, Geneva, 2003. Burch, S. (2005): The Information Society/The Knowledge Societies, World Matters. Carvalho, M.G. (2005): Building Europe Of Knowledge, Invited Lecture, International Conference of World Academy of art and Science, Zagreb. Report of The United Nations Conference on Environment and Development, Vol.1, Chapter 7, June, 1992. Declaration of the Council of Academies of Engineering and Technological Sciences. The Earth Chapter: A Contribution Toward its Realization, Franciscan Center of Environment Studies, Roma, 1995. 1 Knowledge Society - Wikipedia, free encyclopaedia. 2 N.H. Afgan, M.G. Carvalho, Quality, Sustainability and Indicators of Energy Systems, Begell House Publisher, 2009. 3 Chapter of Civil Right for a Sustainable Knowledge Society, Document of the Heinrich-Böll- Foundation, May 2003. 4 Paul A. David and Domenique Foray, Economic Fundamentals of Knowledge Society, The International Social Science Journal, No, 171, 2002. 6 Sally Burch, The Information Society - The Knowledge Societies, World Matters, 2005. 7 Abdul Waheed Khan, UNESCO Assistant Director-General for Communication and Information UNESCOs Basic Text on the Information Society, UNESCO Publishing, 2005. 8 Maria da Graça Carvalho, Building Europe Of Knowledge, Invited Lecture, International Conference of World Academy of art and Science, Zagreb, 2005. 9 Afgan N.H, Carvalho M. G., Sustainability Assessment Method for Energy Systems, Kluwer Academic Publisher, New York, 2000. 10 Report of The United Nations Conference on Environment and Development, Vol. 1, Chapter 7, June, 1992. 11 Agenda 21, Chapter 35, Science for Sustainable Development, United Nations Conference on Environment and Development, 1992. 12 Declaration of the Council of Academies of Engineering and Technological Sciences. 13 The Earth Chapter : A Contribution Toward its Realization, Franciscan Center of Environment Studies, Roma, 1995. 14 C.S. Jenkinson, The Quality of Thomas Jefferson’s Soul, White House Library. Fellow of World Academy of Art and Sciences and the Islamic Academy of Sciences; Member of Academy of Sciences and Art of Bosnia and Hercegovina.